A private path bordered by plants and limestone carvings leads to Villa Kakatua’s traditional Balinese doors. Behind these doors guests are greeted by an aling-aling wall (a short partition wall which, according to traditional belief, protects the villa from bad spirits), a fishpond and a bubbling water feature. Overlooking the pool, Villa Kakatua’s open-sided living area is a great place to unwind or watch a movie under the cooling breeze of the ceiling fans. Decorated with an array of Indonesian artefacts and antiques this room evokes vivid images of ‘old’ Bali. Two comfortable red sofas, topped with bright yellow and blue cushions face a carved wooden coffee table at one side of the pavilion, while a table and chairs at the other provides enough seating for four to enjoy breakfast or an afternoon snack – or perhaps a board game. 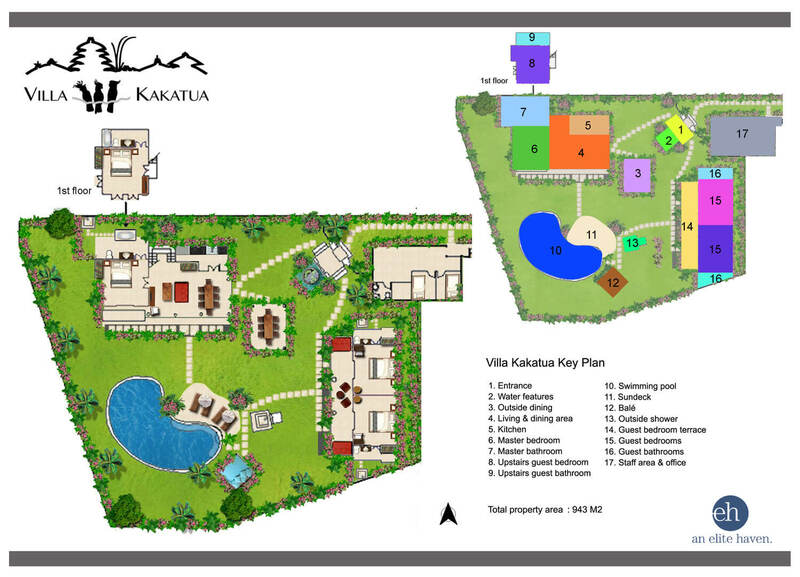 At the heart of Villa Kakatua lies the lagoon-style swimming pool surrounded by manicured lawns and lushly landscaped gardens. Every tropical plant you can think of is on display here, from flowering frangipanis to impressive fan palms and clinging stag-horn ferns.